A DS 20 Pallas, SM OR, DS Bossaert GT 19 Coupe – these outstanding cars take centre stage on the DS brand’s stand at the Rétromobile show this coming February 3-7 in Paris.This display, made possible by the invaluable support of the Amicale Citroën France* and DS and SM clubs**, will bring together five prestigious, vintage models alongside the maker’s latest release, the New DS 3. The DS brand’s second appearance at this event puts sophistication and technology in the spotlight. - A stunning 1963 DS Bossaert GT 19 Coupe! This Bordeaux-coloured vehicle presented at Rétromobile is no doubt the only one still in existence from among the dozen made by Hector Bossaert in the early Sixties. Bossaert, a competition aficionado and renowned expert in prepping race cars, threw all his talent into creating a coupe based on a DS sedan. He invited Italian designer Pietro Frua to determine the vehicle’s aesthetic lines, and the GT 19 Coupe was born! An astounding creation, with a 47cm shorter chassis and 7cm lower profile, more angular lines, with elongated, stand-out fins taking on their seductive curves just behind the doors and vast wheel wells over the rear tires. The rear bumper and curve of the trunk symmetrically echo the car’s front, and the panoramic rear window provides breath-taking visibility. The interior is right out of a Sixties sports car, with tachometer and coolant temperature gauge (the vehicle on display also features a “Jaeger” dashboard). Customers could even opt for leather seats, a three-spoke, wood-trimmed steering wheel, and an engine prep that could squeeze out speeds of up to 172 km/h. - A 1974 DS 20 PALLAS. Dressed in a pearly grey known as Gris Nacre, with a gloss black roof, this vehicle’s interior is upholstered in caramel-coloured jersey. 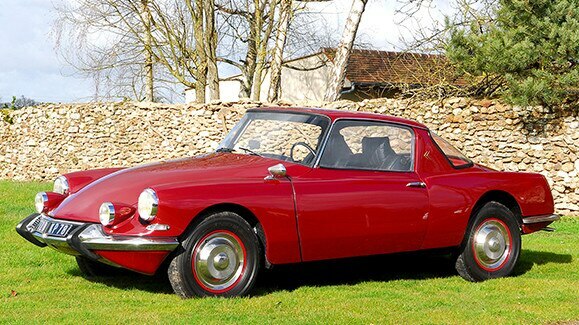 The Pallas version was first presented in October 1964 at the Paris Auto Show, a landmark date in the history of the DS, when the maker displayed a sophistication of detail and finishing previously unseen in production cars. It differs from other DS models by virtue of its luxurious, exquisitely crafted features, including chrome trim, special hubcaps, and thicker seats. - A 1972 DSpécial in Blanc Meije white with a Targa black interior. This “D” range first appeared in September 1969, when the DSpécial replaced the ID19 in the Deluxe (Luxe) and Comfort (Confort) versions. The model displayed at Rétromobile is equipped with power steering and an auto-defrost rear window, two on-demand options. The car’s top speed is 160 km/h. - A 1975 SM Injection, the next-to last produced in the Ligier workshops in Abrest, located in France’s Allier department. Exhibited in mint condition, this car is white with a blue-green fabric interior. It also boasts tinted windows and air conditioning. Like the latest SMs off the production line, it has the distinction of having retractor seatbelts and dashboard push-button warning lights as standard equipment. - An SM OR, an inimitable model prepared especially for this latest Rétromobile show. After being sanded, given two coats of paint, then three of clearcoat, this SM is a superb representation of an automobile with futuristic lines and forward-thinking technology. The 1971 model on display is equipped with a carbureted V6 Maserati engine, tinted windows, air conditioning, and a Havane brown leather interior.